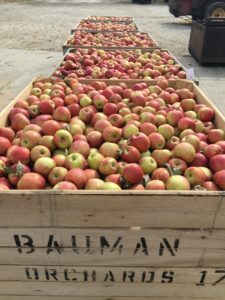 Bauman Orchards has been a grower and seller of fine fresh produce such as apples, peaches, plums and sweet corn, since our start in 1929 in Rittman, OH. Over the years we have grown from 18 acres to our current size of over 260 acres. We now have a total of 48,500 apple trees and 9,200 peach trees, featuring 25 varieties of apples and 15 varieties of peaches. The orchard’s cider presses are busy each year from September through May making fresh cider that we sell in our Farm Market in addition to homemade pies, cookies, gift baskets and, of course, our variety of produce. If you live near the Wooster, Mansfield or Ashland OH areas. Be certain to visit our Scenic Ridge location in Jeromesville, OH. Our Scenic Ridge location boasts more than 84 acres of fruit trees in addition to strawberries, grapes, sweet corn, and a variety of other fresh vegetables. Thanks for visiting our website. We welcome you to browse around to learn more about our locations, products and events.